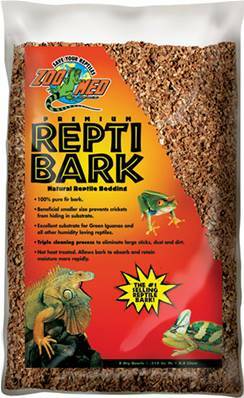 Zoo Med Premium Repti Bark is a 100% natural product made from the ground bark of fir trees. It goes through a three-stage cleaning process to rid the bark of large sticks and all dust and dirt. The smaller size prevents crickets from hiding in substrate. Perfect substrate for all high humidity loving reptiles. Hygroscopic--absorbs moisture and then releases it, creating humidity. Not heat treated--allowing bark to absorb and retain moisture more rapidly. Adds environmental stimulus through natural digging and burrowing activity. 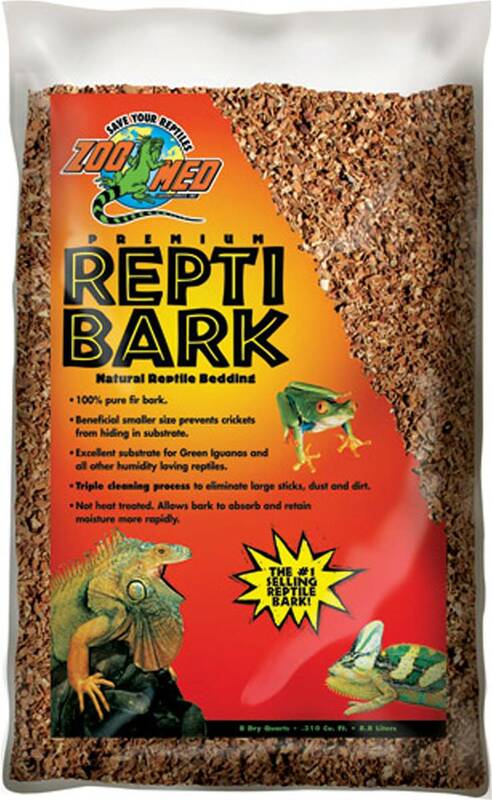 Use Zoo Med's Repti Bark for the following reptiles and amphibians: green iguanas, anoles (american chameleons), gold skinks, day geckos, tokay geckos, prehensile tail skinks, tree frogs, baslisk lizards, house geckos, water dragons, tree boas, tarantulas, millipedes, hermit crabs, asian land box turtles, and american box turtles.